Click here to by-pass the body of text below and get straight to the various shades that are available. Please return and read this as there is important information that you will need to know about these reproduction shades and how to order them. Sinumbra shades are available in three basic sizes: 8 inch, 9 inch, and 10 inch. Since fonts of a given size may vary from these three basic dimensions, these shades are being blown in a manner that makes it possible to control the size of the fitter. This results in availability of shades that will fit fonts with fitters that range from 7-1/2 inches to 10-1/2 inches. On some fonts, the platforms upon which the shade rests are fairly wide and so the fitter dimensions are not overly critical. On others, this platform is very narrow and it is critical to measure the font accurately to ensure a proper fit; on these fonts it can also be desirable to measure the font for both the maximum outside diameter as well as the minimum inside diameter of the fitter. Since most fonts are not perfectly round it is also important to take measurements in at least 6 equally spaced points so that the smallest maximum and largest minimum diameters can be determined. To this end, special measuring instruments have been designed and made so that the difficult-to-measure sinumbra fonts can be accurately measured. First, let's address some glass related terminology. Taken from Beginning Glassblowing by Edward T. Schmid, 'lip' is defined as the "top of a vessel a.k.a. rim." 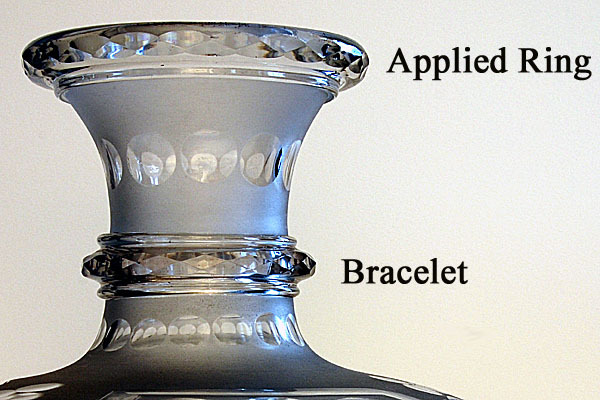 A 'lip wrap' is defined as "a thread of glass applied to the mouth of a vessel". 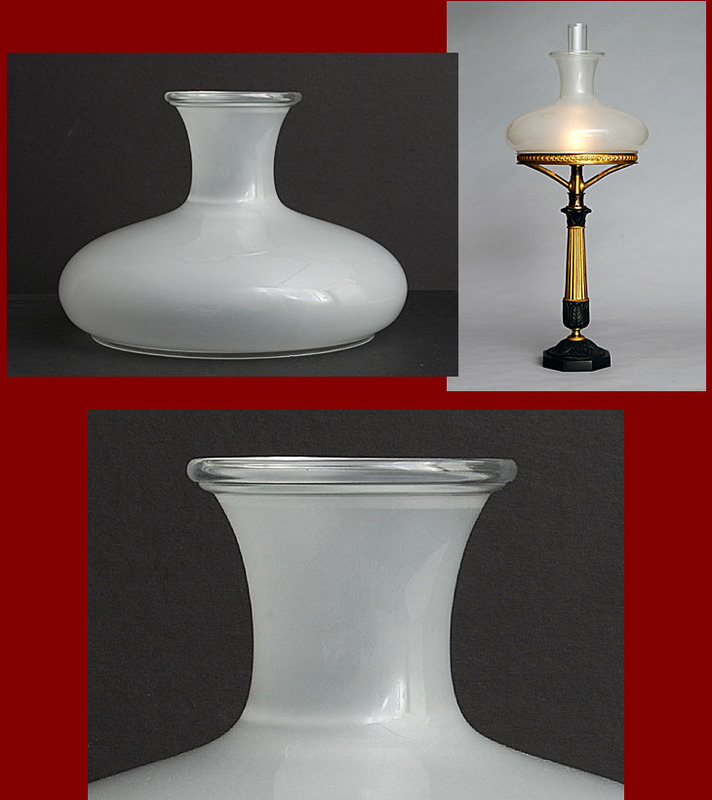 Since this 'lip wrap' is commonly referred to as an 'applied ring' by lamp collectors, this is the term that will be used to define the glass wrapped around the rim of the shade. According to Ike Hay, military weaponry collectors use the word 'bracelet' to define the rings around a sword scabbard at the point where the suspension rings are attached; these scabbard rings might be related to the applied neck ring on the neck of a sinumbra shade. Based upon this and the common understanding of the word 'bracelet', the applied ring that surrounds the neck of a sinumbra shade will be referred to as a 'bracelet'. Note that period shades were not perfect. The width of an applied ring or bracelet may vary at different points around its circumference - in the photograph above you can see that the width of the bracelet is greater at the left than it is at the right. You might also notice that these elements many not be parallel to the base or fitter of the shade. And finally, if you were to measure the diameter of the shade at different points you will likely find that it will vary as well. While period shades might appear to be perfect, most are not. 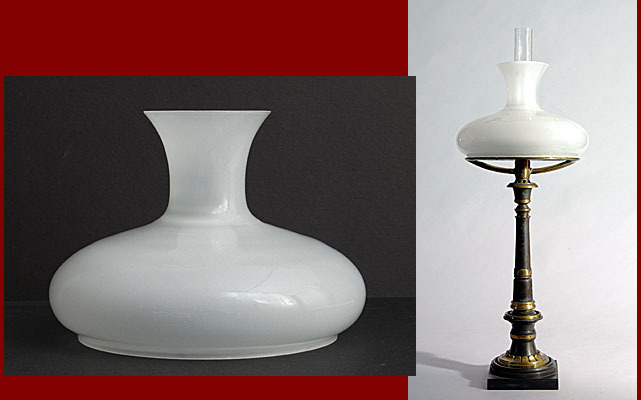 There are at least two reasons why imperfections are not so readily noticed: first, most people do not closely inspect a shade - they are looking at the lamp as a whole and second, in the case of cut shades, the cut design attracts attention that might otherwise wander to other aspects of the shade. While the glassblowing method that is used to make these reproduction shades allows for precise control of the fitter size and the ability to vary the fitter size (something that was difficult or impossible to do by free-hand blowing or mold blowing) it is not possible to apply the rings of glass that one may see on the neck and or the rim of some sinumbra shades. These rings were applied as short, fat, oblong slugs of molten glass called 'bits'. They were applied to the hot shade by pressing one end of the bit on the rim or neck; the bit was then drawn out and around the circumference of the shade as the shade was rotated. Various hand tools were then used to shape this applied ring. After the shade was annealed the surfaces of these rings were usually ground or faceted. When viewed from the outside, the applied rings on these reproduction shades closely resemble those on period shades however they will differ in appearance when viewed from the inside of the shade; the 'applied rings' are not hollow or concave but by the same token the profile of the inside surface is not exactly the same as that on a period shade. Shades are provided with either an outside or inside frost. The fitters can be either frosted or clear and on shades with an 'applied ring' the ring is clear. The fitter and top edge of each shade are fire polished. We have experimented with grinding a faceted finish on the ring and it is expected that this option will be available sometime in next year. Cut shades are not presently available and may never be so. Cutting is terribly expensive; related expenses could easily add two thousand dollars to the overall cost. It is believed by a growing number of people that un-cut shades were much more commonly used than most would think. They were less expensive and in many cases more practical - consider that many sinumbra table lamps were used for reading purposes and that a soft unbroken beam of light would be easier on the eyes (a point of considerable concern in the period) than that produced by a cut shade (a portion of Edgar Allan Poe's essay The Philosophy of Furniture addresses this point as well as others - the essay is short and both thoughtful and amusing - click here to read it). It is believed that more cut shades have survived than un-cut shades for at least several reasons: first, due to the deep cutting the wall thickness of cut shades had to be much greater than that of un-cut shades and so they would be less easily broken and second, even in the period cut shades were much more expensive than un-cut shades making it more likely that they were saved and passed down from generation to generation. A standard Argand style chimney is used with the sinumbra shades. Height of the chimney should be enough so that at least an inch extends above the top edge of the shade. If you were to study period paintings that include a sinumbra lamp you might observe that there does not appear to be any set rule for the overall height of the chimney - they might extend from an inch to as much as 4 inches above the top of the shade. I do not believe that there is a right or wrong answer to the question "What height chimney should I use?" - choose what looks pleasing to you. If you consider the shade and chimney as an entity rather than as two separate pieces, you will find that matching a short, squat shade with an appropriately sized chimney will result in a striking, well proportioned unit. All sinumbra shades are made to order. 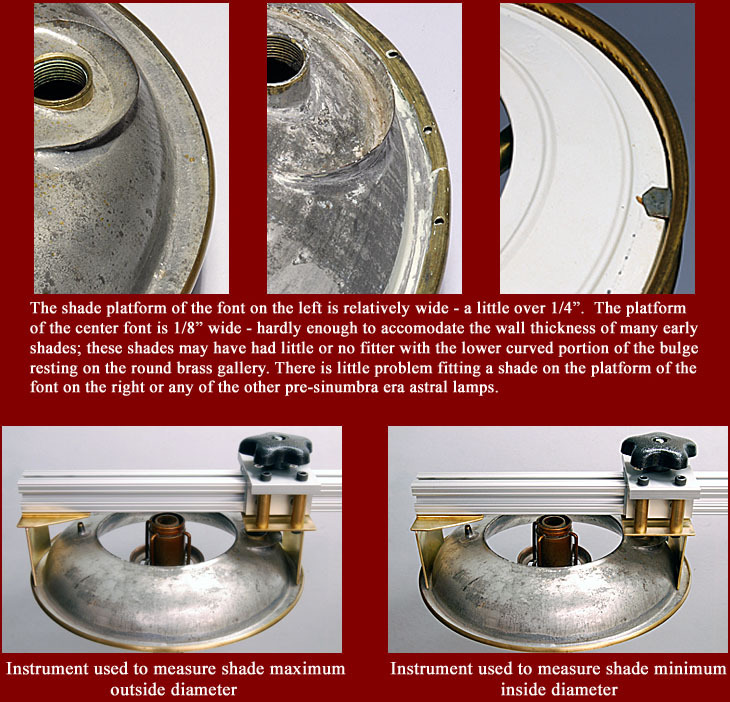 The shade is guaranteed to fit your lamp if you deliver or ship the font to the shop for measurement. However, should you decide to measure the font yourself and if the measurements of the shade match those that you sent, then the shade cannot be returned. The profile of this shade has been reproduced from an original. Dimensions are as follows: height: 8", diameter of the bulge: 10-1/2", diameter of the neck: 2-1/2", diameter of the rim: 4-1/16". The shade is pictured frosted on the inside and with a clear fitter. The profile of this shade with applied ring has been reproduced from an original. Dimensions are as follows: height: 7-11/16", diameter of the bulge: 11", diameter of the neck: 2-5/8", diameter of applied ring: 4-7/16". 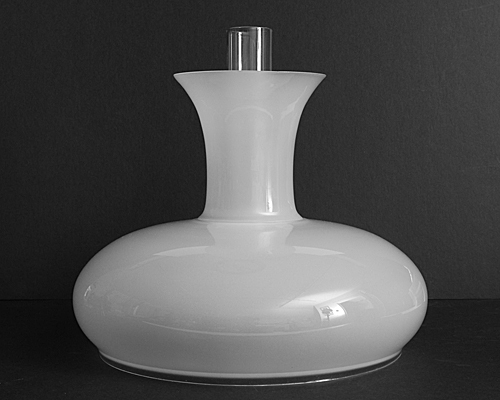 The shade is pictured frosted on the inside and with a clear fitter and applied ring. The profile of this shade is the same as that of the shade pictured below with the applied ring. Dimensions are as follows: height: 7-13/16", diameter of the bulge: 10-15/16", diameter of the neck: 2-5/8", diameter of the rim: 4-7/16". The shade is pictured frosted on the inside and with a frosted fitter. Some early sinumbra shades extended downward below the font and curved inward toward the burner tube. 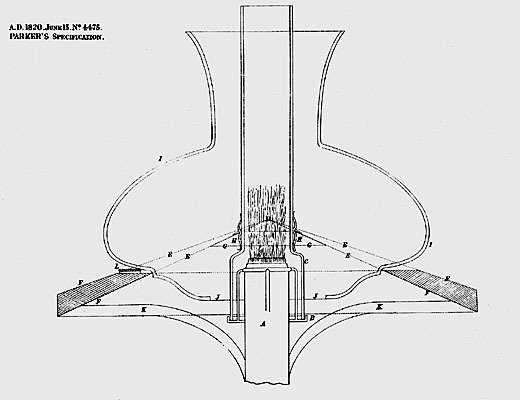 They date back to at least as early as 1820 and are depicted in the patent illustration that accompanies Samuel Parker's 1820 patent for a "shadowless" lamp; this illustration is pictured below. While Parker himself did not refer to the lamp in his patent as a "sinumbra" lamp, it was referred to as this by authors who wrote reviews that were published later in that year for various scientific journals in England and Europe. The early sinumbra lamps, more properly referred to as Astral lamps, were supplied with hemispherical shaped shades. Since there appears to be a wide range of font sizes these shades are custom-made to fit you lamp. Frosting can be done on either the inside or outside surface - the shade in these photographs is frosted on the inside. 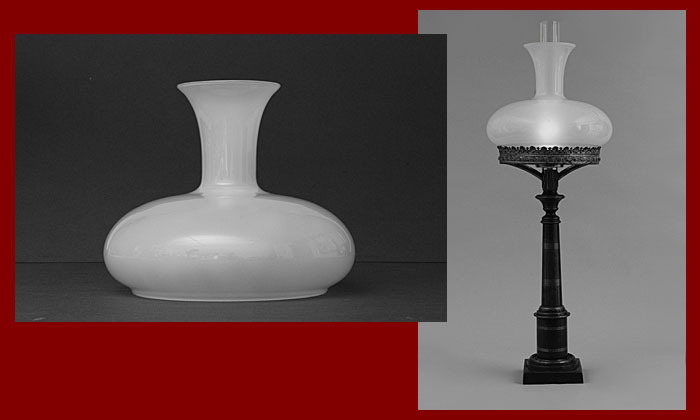 It is interesting to note that in the period these shades were commonly frosted on the inside and cut with fine, delicate patterns on the outside; the unpolished cut designs contrasted against the background without the resulting bright shafts of light that resulted from the outside frosted, heavily cut and polished designs of the later period sinumbra shades. 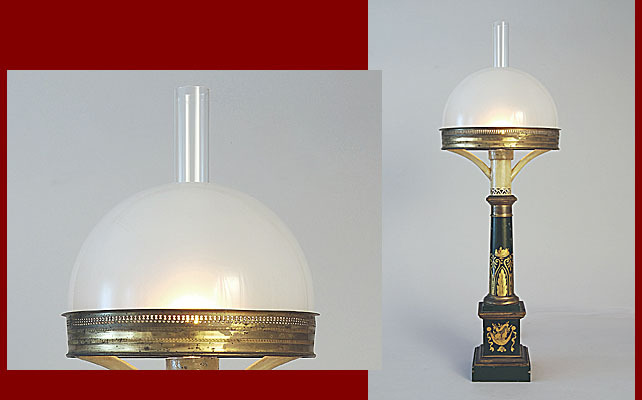 Astral shades were often adorned with a brass crown that surrounded the chimney opening in the top of the shade; crowns will be available upon request. I have not come across much reference material that relates to these pre-sinumbra era shades. 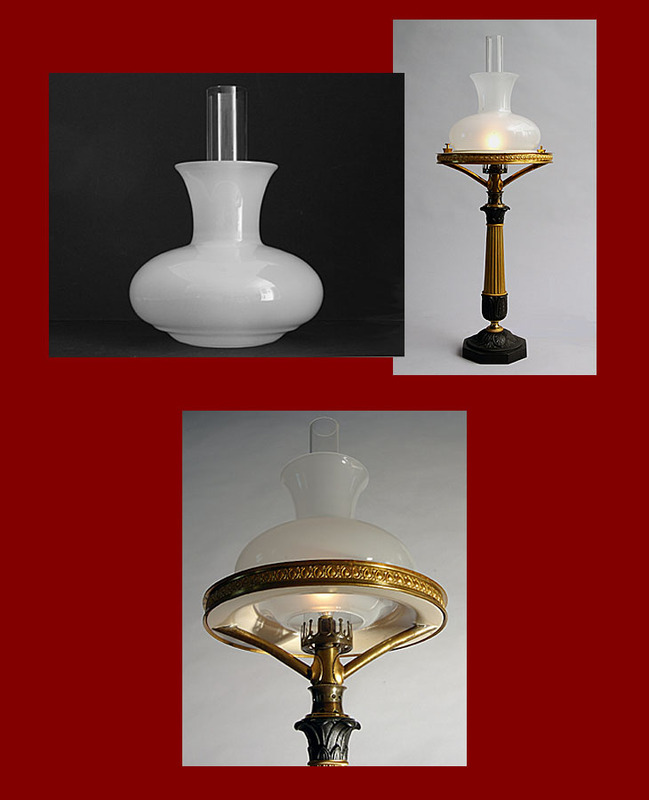 There are two to which you might want to refer: Brandy, Balloons, and Lamps by John J. Wolfe (plates 44 & 46) and an article titled "Successful Innovations in Domestic Oil Lighting 1784-1859" by Vincent P. Plescia in The Magazine Antiques, December 2005.